If you follow my other blog - The Journey of the Pudgy Pomegranate - you know that I'm on a quest to get healthy by losing weight, incorporating exercise into my daily routine, and eating clean. I'm trying to develop new habits, and one of the things that I've gotten in the habit of doing, is walking on my lunch hour 3-4 times a week. I work in Downtown Los Angeles where traffic signals are abided by (much to the chagrin of my husband), and when you have a lunch hour, you don't want to spend any more time than necessary waiting for the red light to change to green. So a few months ago, my friend and I invented what we call "The Green Light Walk". Here's how it works. You start walking at a fast pace moving around people that are just strolling....and when you come to the corner, you go wherever the green light is. In other words, you don't stop. If the signal is red one way, turn and go toward the green. It's that easy. And let me tell you, it takes you way out of your way and all over the city. You may make turns...or go straight for a half a mile hitting every green; and sometimes you end up going in a circle. You see neighborhoods and people that you normally wouldn't see (or maybe wouldn't want to see). You look at buildings and architecture - old and new. You discover "districts". Like the fashion district, the financial district, the old theater district, the garment district. Rich, homeless, all ethnic diversities, legal and illegal, young, old, we see it all on the green light walk. When we've strayed too far and our lunch hour is coming to a close, we do have to head back to the office. But on average, we walk 3 to 3-and-a-half miles at a time. And while we're doing it, we use a smart phone app called, "Charity Miles" which acts as a pedometer and donates meals or funds to the charity of your choice for free. All you have to do is walk (run or bike) and push start before you begin. So our lunch walk serves two purposes: exercise and donating to charity. It's a win:win. 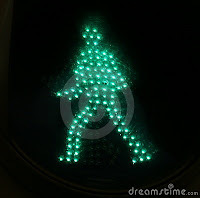 So on today's walk I started thinking about the similarities between life and the green light walk. My father always taught us that the only one that stops you is yourself. And this is so true when we're out walking. Like the red light, when we come upon an obstacle in our lives, it's really up to us how we're going to receive it, isn't it? We can stop and wait for things to change before we pick up and go again, or we can take a different route. Doing so isn't always the safest thing to do, nor is it the most direct way to get to where we're going, but it's filled with new adventures, new things to see and new people to interact with. While you're on your journey, it's always more satisfying when you are able to help those in need along the way, and that adds a different purpose to the journey. Now you're not just wandering, but you're wandering with purpose. : ) What's that line from Tolkein's poem? "Not all who wander are lost." And we're definitely not that. In fact, the opposite is true. The more we walk, the more we find ourselves. Especially when we're walking alone. Walking alone affords us the quiet time we need to hear our inner self, to pray, and to quiet the mind, but that's a whole different Oprah. Whether you're choosing to share life's journey with a friend or taking it solo, make sure to give yourself permission to just WANDER a bit, see (and feel) something new, take off the blinders and look around. Don't be in so much of a rush that you forget to look around and help those around you who may have lost their way. 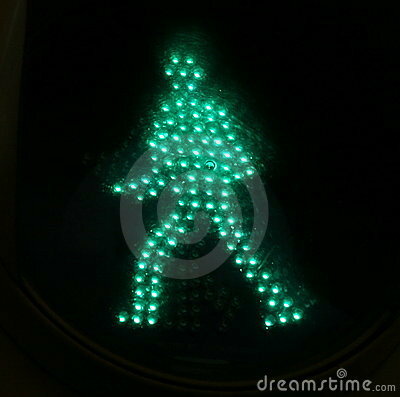 Remember, like the Green Light Walk, life is not so much about the destination but about the journey! A Look Inside: What's Hair Got to Do with It?